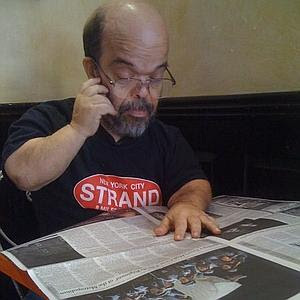 A colorful dwarf activist for gay rights and issues affecting the disabled as well as a transportation advocate was hit and killed by a taxi late last night as he left a community board meeting on the Lower East Side, authorities said. Harry Wieder (pictured), 57, walked with crutches and was leaving a meeting of Community Board 3 around 9:45 p.m. at P.S. 20 when he crossed Essex Street in the middle of the block and was hit by a yellow cab, said a fellow board member. "We had all just left the meeting and his car was parked across the street. It was as laborious for him to walk. For him to walk to the corner and cross the street would have been extremely difficult. He was crossing the street in the middle of the block," said district manager Susan Stetzer. "The cab driver was very distraught." Wieder was rushed to Bellevue Hospital where he was pronounced dead. The diminutive crusader got his start as an activist in the early 1980s when he came out as gay and got involved in the rights group Act-Up. "He came out of the closet like a cannon-ball," said author Betty Adelsen, who profiled Wieder in her 2005 book, "The Lives of Dwarves: Their Journey From Public Curiosity Toward Social Libertaion." In the following years. Wieder became a fixture at community board meetings, rallies and all sorts of political events, where he became well known to the city’s political players. "He was everywhere and involved in so many different things," said City Council Speaker Christine Quinn. "He was undaunted by his physical challenges. I never heard Harry say, ‘I can’t do that, that march is too long.’"
"Harry was a small person but he was a very big personality. He had a big voice and a very colorful character," said Anne Emmerman, the former commissioner of the department of the aging during the Dinkins Administration. Wieder, the child of Holocaust survivors, was born in 1953 with achondraplasia – a kind of dwarfism — and was raised in Forest Hills. In the early 1980s he underwent surgery on his spine that left him walking with crutches or using a wheelchair for the rest of his life. He also suffered significant hearing loss and lived in a home for the deaf on the Lower East Side. But he never let his troubles stop him from being involved. "Harry was so dedicated and he showed up to a lot of the meetings even if he wasn’t on the committee," said Community Board 3 chairman Dominck Pisciotta. "He was the ultimate activist. He cared a lot about the community and many different issues as well." NEW YORK, N.Y. - The Turkish-German drama "When We Leave" and the Down syndrome romance documentary "Monica & David" (pictured) have won top honors at the ninth annual Tribeca Film Festival. "When We Leave," which stars Sibel Kekilli as a mother who flees her abusive husband by moving with her 5-year-old son from Istanbul to Berlin, won best narrative feature. Kekilli also won best actress. The jury that decided the category, which included actors Hope Davis and Aaron Eckhart, said in a statement that "When We Leave" ''examines one woman's struggle for personal freedom. It's a theme that is often explored — but rarely told with such humanity, subtlety, craftsmanship or immediacy." "Monica & David," which won best documentary, chronicles the love between two people with Down syndrome. It was directed by Alexandra Codina, Monica's cousin. Best actor in a narrative feature film went to Eric Elmosnino, who plays the French musician Serge Gainsbourg in "Gainsbourg, Je t'Aime ... Moi Non Plus." The festival also singled out two new filmmakers: Kim Chapiron, the director of the youth correctional facility drama "Dog Pound," and Clio Barnard, the director of the British documentary-fiction hybrid "The Arbor." Jane Rosenthal, who co-founded the festival with Robert De Niro and her husband, entrepreneur Craig Hatkoff, said: "The award-winning films selected by the jury each features strong characters and subjects; these films challenge you to see the world from another perspective." The awards were handed out April 29 at a ceremony in New York. Tribeca, which finishes May 2, will screen "Freakonomics" on April 30 as its closing film. An experimental drug succeeded in a small clinical trial in bringing about what the researchers called substantial improvements in the behaviors associated with retardation and autism in people with fragile X syndrome, the most common inherited cause of these mental disabilities. The surprising results, disclosed in an interview this week by Novartis, the Swiss pharmaceutical giant that makes the drug, grew out of three decades of painstaking genetic research, leaps in the understanding of how the brain works, the advocacy of families who refused to give up, and a chance meeting between two scientists who mistakenly showed up at the same conference. Dr. Mark C. Fishman, president of the Novartis Institutes for BioMedical Research, cautioned against too much optimism. The trial involved only a few dozen patients, only some of whom benefited from treatment. The drug is likely to be years away from being commercially available and could fail in further clinical trials, he said. If authenticated in further, larger trials, the results could also become a landmark in the field of autism research, since scientists speculated that the drug may help some patients with autism not caused by fragile X, perhaps becoming the first medicine to address autism’s core symptoms. One child in five thousand is born with fragile X syndrome, with mental effects ranging from mild learning disabilities to retardation so profound that sufferers do not speak, and physical effects that include elongated faces, prominent jaws, big ears, and enlarged testes. It mostly affects boys and earned its name because, under a microscope, one arm of the X chromosome seems nearly broken, with part hanging by a thread. The gene for fragile X was discovered in 1991. Work since then has found that fragile X patients seem to experience an overload of unchecked synaptic noise — synapses being the junctions between brain neurons. The Novartis drug and others like it are intended to lower the volume of this noise so memory formation and high-level thinking can take place, allowing children to develop normally. The Novartis trial, which began in 2008 in Europe with data analysis completed this year, was too brief to observe effects on basic intelligence. Instead, researchers measured a range of aberrant behaviors like hyperactivity, repetitive motions, social withdrawal and inappropriate speech. They gave one set of patients the drug and another a placebo, and after a few weeks switched treatments, with both doctors and patients unaware of which pill was which. The results of the trial were something of a jumble until Novartis scientists noticed that patients who had a particular, undisclosed biological trait improved far more than others. “The bottom line is that we showed clear improvements in behavior,” Dr. Fishman said. Told of the results, two parents of a fragile X patient were euphoric. Geraldine Dawson, chief science officer at Autism Speaks, the world’s largest autism advocacy organization, said that a growing body of research suggests that the many genetic causes of autism all seem to affect synapses, suggesting that a treatment for one form of the disease might help others. “The exciting thing about these results is that it is our hope that these same medications may have similar positive benefits for people with autism who don’t have fragile X syndrome,” Dr. Dawson said. Between 10 percent and 15 percent of autism cases result from fragile X syndrome or some other known genetic defect. While fragile X is the most common inherited cause of mental retardation, Down syndrome — which also causes retardation — is more common but is not inherited. The Novartis trial results were not published or peer reviewed, and for commercial reasons Dr. Fishman refused to divulge many details. Dr. Luca Santarelli, head of neuroscience at Roche, confirmed that Roche is in the midst of testing a similar medicine in fragile X patients at four sites in the United States. “So far we like what we see,” Dr. Santarelli said in his only characterization of their study. One reason for the euphoria surrounding the Novartis trial is that it was seen as an especially difficult test of the drug’s effects. For ethical reasons, Novartis tested the drug only in adults. But the company and outside researchers believe that such compounds may prove most effective in young children, whose brains are far more likely to respond rapidly when barriers to learning are removed. “This is perhaps the most promising therapeutic discovery ever for a gene-based behavioral disease,” said Dr. Edward M. Scolnick, former research chief at Merck and now director of the Stanley Center for Psychiatric Research at the Broad Institute at Harvard and the Massachusetts Institute of Technology. The roots for the Novartis results began in 1982 when Stephen T. Warren, then a graduate student in genetics at Michigan State University, was looking for a job and something to research. A friend told him about fragile X and, with the same reflection he might use to pick a novel for a long flight, he decided that he wanted to find the gene that caused it. “I had no idea how hard this would be,” Dr. Warren said. Nine years later, Dr. Warren, then at Emory University, was part of an international team that won a fierce competition by isolating the gene. The discovery was front-page news around the world, and experts predicted that widespread fetal testing and therapies were in the offing. The predictions were premature because, like most of genetic research, discovering how the flawed gene caused disease was far harder than anticipated and required multiple leaps in neurology and biology. And even with those, much remains mysterious. Fragile X is caused by a genetic stutter in which a portion of the gene gets repeated like a scratched album. With each subsequent generation, the number of repeats tends to rise. So if a mother has 10 repeats, her child might have 11 or 12. For reasons that are not well understood, however, this process of repeat amplification can suddenly go haywire. So mothers who have 55 or more repeats tend to have children with hundreds. In anyone with 200 or more repeats, the body shuts off the gene. Since genes are used to make proteins, this genetic silencing means the encoded protein is never made. The absence of this protein in cells causes the wide-ranging effects of fragile X syndrome. Those with 55 to 200 repeats are considered carriers, and recent research shows they can have severe neurological declines late in life that mimic Alzheimer’s and Parkinson’s. Many geneticists would have moved on to other research topics after finding a disorder’s underlying gene. But Dr. Warren met affected children and their parents. 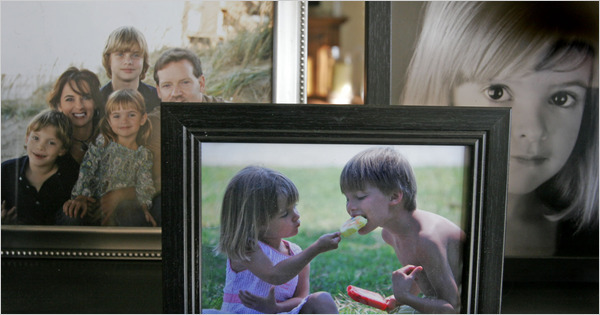 Instead of family pictures, Dr. Warren’s desk displays a framed photo of a fragile X chromosome. “I could not imagine telling someone like Katie Clapp that we were not going to pursue this research anymore,” he said. So he kept on. Years of work by him and others found that the protein missing in those with fragile X normally seems to act as a sort of traffic cop at brain synapses, helping to stop or slow brain signaling at crucial intervals. It does this by sopping up the genetic instructions needed to produce proteins that encourage brain signaling. Regulating this flow of electronic pulses across the brain is crucial for the brain’s ability to learn and mature. Dr. Warren was puzzling over how to recreate that synaptic traffic cop when, because of a scheduling conflict, he showed up in 2001 at the wrong scientific conference and happened to sit next to Mark F. Bear, a neuroscience professor at M.I.T. who had just given a presentation about compounds that seemed to work in synapses to speed the creation of proteins — including the one missing in fragile X patients. The two got to talking and decided to collaborate. They found that if Dr. Bear reverse-engineered his compounds, they seemed to slow brain transmissions. Instead of a traffic cop, the brain would get speed bumps. Not ideal, but perhaps adequate in lowering the synaptic noise enough to encourage learning and the moderation of the kind of synaptic traffic jams that in fragile X children can lead to seizures. Sure enough, mice, fish and fruit flies that through genetic engineering were made to have fragile X seemed to become normal when given Dr. Bear’s compound. The Novartis compound is a member of the same drug family. 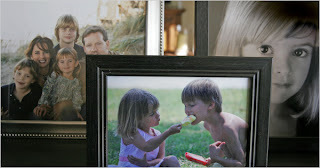 A hundred years ago, Katie Clapp would have died giving birth to Andy, her child with fragile X. “Andy’s head was too big to get out without a C-section, he would have killed me, and that would have taken care of the fragile X gene,” she said. But Ms. Clapp and Andy (pictured) did survive. And despite going to some of the best hospitals in the country, four years would pass before Andy’s condition was properly diagnosed. When a doctor finally thought to do a fragile X test, Ms. Clapp and her husband, Dr. Michael Tranfaglia — both Harvard graduates with post-graduate degrees — researched the disease and came to two conclusions: fragile X was potentially treatable; and only about five researchers in the world were working toward a cure. So the two started the Fraxa Research Foundation. Remarkably, their efforts seem to be paying off and may finally offer hope not only to those who with fragile X but to carriers like Andy’s sister, Laura. WASHINGTON D.C. -- ADAPT activists spent the day on Capitol Hill contacting lawmakers about the importance of the Community Choice Act (CCA, S 683 and HR 1670) and responding to fears of the legislation’s cost with new independent data that shows the CCA will cost the average taxpayer about six dollars. CCA will end the nationwide institutional bias in Medicaid funding and give Americans with disabilities the real supports and services they need to get out of expensive institutions and rejoin community life. Following the afternoon with lawmakers, ADAPT activists had a promised question and answer session with Principal Deputy Assistant Attorney General for Civil Rights Samuel R. Bagenstos. Speaking for the Department of Justice, Bagenstos said that ADAPT can expect to see the DOJ to bring cases and release consent decrees dealing with enforcement of Olmstead. The demographics of our nation are changing, the population is aging and more people with disabilities need assistance with daily living tasks. Although community services have been shown to be less expensive on average than institutional services, and home and community services are clearly better liked by individuals, most public funding goes to facilities. 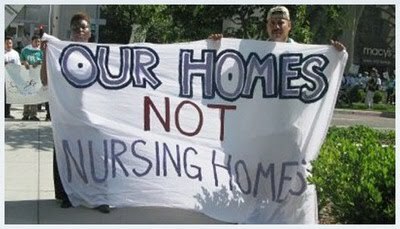 In FY 2005 67% of our total $94.5 billion long term care Medicaid dollars ($63.3 billion) are spent on nursing homes and other institutional services, leaving only 33% ($31.2 billion) for all community services. But the big news was that a Harris poll made following the health care reform debate shows that Americans are willing to pay taxes to have choice in long-term care. Analysis shows that CCA will annually cost middle class taxpayers an average of $6.07 for the highest cost scenario for CCA. 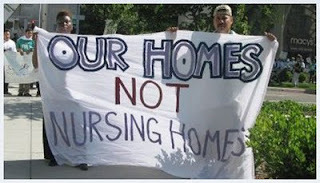 Release results of Harris Poll showing 89% of all Americans, and 94% of retirees support legislation like the Community Choice Act which would provide home and community-based supports and services instead of older and disabled Americans being forced by the current Medicaid law into nursing homes and other institutional settings that they do not desire. The Harris Poll showed overwhelming support for CCA, across age groups and all regions of the country, with that support increasing to a high of 94% in the baby-boomer and retiree age group. Even more striking was the fact that supporters said "yes, I would pay an extra $6 per year in taxes to fund this community-based option." The $6 figure was calculated via three different methodologies, by the Coalition for Community Integration and two universities, using IRS numbers and the result was the same each time. In addition, the $6 represents the cost to middle-class tax-payers in the "worst-case" scenario. Supporters of the ADAPT event were: Coalition for Community Integration, American Association for People with Disabilities, National Council on Independent Living, TASH and additional disability groups from the Justice for All Action Network. ALBUQUERQUE, N.M. -- A new school for the deaf is coming to the Duke City. The county commission voted this week to lease a county building to the ABQ Sign Language Academy. The new school will be the only school for the deaf in the Duke City. Kimberly Silva's son Thomas is deaf and attends an Albuquerque Public School that has a special program that fits his needs. She said sometimes there are disadvantages. "When you only have 25 or 30 that are deaf or hard of hearing, that limits the number of students you can talk with or work with," said Silva. The school will be more convenient for hearing-impaired students, who currently have to go to Santa Fe to attend a school for the deaf. The charter school will be in downtown Albuquerque. The cost to renovate the building is $500,000. County officials said that $400,000 will come from them and $100,000 will come from the state. County Commissioner Art De La Cruz said that the county is budgeted for special projects like this. "We want to make sure we have a safe, healthy building so the county is accepting that responsibility as a landlord fundamentally," said De La Cruz. According to officials, ABQ Sign Language Academy will pay $30,000 a year to the county. The school will be responsible for its own utilities and operating expenses. The Academy will take 40 children and will start enrollment in July. WASHINGTON, DC –- Mental Disability Rights International (MDRI) has found children and adults with disabilities tortured and abused at a “special needs” residential facility in Massachusetts and has filed an “urgent appeal” with the United Nations Special Rapporteur on Torture to demand the United States government end the torture immediately. MDRI’s latest report, Torture not Treatment: Electric Shock and Long-Term Restraint in the United States on Children and Adults with Disabilities at the Judge Rotenberg Center (JRC), documents the use of electric shocks on the legs, arms, torsos and soles of feet of people with disabilities – for weeks, months and sometimes years. JRC (pictured) uses punishments as treatment and US advocates have been trying for decades to close the school and end these practices. The school also uses 4-point restraint boards, tying children to the boards while simultaneously shocking them for hours; mock assaults; food deprivation; shock chairs; isolation and long-term restraint. Residents at JRC are diagnosed with a variety of behavioral, intellectual and psychiatric disabilities such as autism, bi-polar disorder and learning disabilities. MDRI calls on the Special Rapporteur, along with the Obama Administration and the Department of Justice, to end the abuses against people with disabilities at JRC. MDRI is an international human rights and advocacy organization dedicated to the rights protection and full participation in society of people with disabilities worldwide. The Bloomberg administration, struggling to address the needs of a growing number of students with learning disabilities, is overhauling special education by asking every principal to take in more of the students and giving them greater flexibility in deciding how to teach them. This fall, more than 250 schools will be asked to accept more students with disabilities rather than send them to schools that have specific programs for special education, as has been the case for decades. By September 2011, principals at each of the system’s 1,500 schools will be expected to enroll all but the most severely disabled students; those students will continue to be served by schools tailored exclusively to them. The shift echoes one of the central philosophies of the administration, giving principals more responsibility and control over their schools. It is also an effort to bring New York more in line with the nationwide trend of allowing special education students to benefit from regular classroom settings. But some special education advocates and principals worry that the changes could be too difficult for principals with little knowledge of special education, who are already strained by day-to-day issues and impending budget cuts. “This is fundamentally looking to change the way kids with special needs are treated in the city — they’re talking about changing the culture of all the schools in the city so that they can serve students that many of them were previously shipping out,” said Kim Sweet, the executive director of Advocates for Children of New York, which helps parents navigate the special education system. “This could easily fall flat if it’s not done right. Like other large cities, New York has had difficulty figuring out how to provide appropriate services for disabled students without isolating them, and how to manage large spending increases on special education. Enrollment in special education programs has climbed to some 177,000 students, or more than 17 percent of the system, up from roughly 13 percent in 2003. Experts in special education say it is difficult to know what has caused the increase. Theories include better identification of students with learning disabilities, particularly autism; parents being less reluctant to see their children identified as disabled; and the possibility that more children might actually have difficulties than in years past. The city now spends $4.8 billion annually on special education, up from $3.8 billion five years ago. That includes $1.2 billion to send students to private schools. Recent state and United States Supreme Court rulings strengthened the rights of parents of special education students to receive private schooling at taxpayer expense if public schools cannot give them the services they need. Education Department officials said that they did not believe they would save money and that costs did not factor in their decision to make the change. Rather, they said, it was an effort to improve results for special education students. While graduation rates have risen over all, for example, the rates for special education students have remained stubbornly low — fewer than 25 percent received a regular diploma last year, compared with more than double that for traditional students. Mayor Michael R. Bloomberg and the city schools chancellor, Joel I. Klein, first pushed to move more disabled students into mainstream classes in 2003. The effort never took hold. Making matters worse, many student files were misplaced or lost, and some students received no services for months at a time. Since then, the department has spent more than $40 million to computerize records. Laura Rodriguez, the deputy chancellor for special education and students still learning English, who was appointed last year to oversee the changes, said she was confident they would stick this time because so many educators were frustrated with the system. Some schools have no special education students. Others, particularly in black and Hispanic neighborhoods, have as much as one-third of the student body receiving services. Ms. Rodriguez said there was a narrow divide between some students classified as special education and those who simply struggled in math and reading. Exactly how the new policies will be carried out remains uncertain. The department could not say how it would enforce the requirement that principals accept more special education students. Officials did say there would be no quota for each school. Selective schools like Stuyvesant High School would continue to grant students with disabilities extra time to complete admissions tests and would not be expected to soften their entry requirements. Officials also said they did not expect to make changes in District 75, which serves 23,000 special education students in schools dedicated to them. Principals are also wary of violating myriad complicated special education laws. Many of the city’s services for students with disabilities are governed by court-ordered consent agreements, the result of lawsuits brought by parents demanding appropriate services for their children. But Ms. Rodriguez said the law allowed principals more flexibility than most of them realized. In New York City schools, special education students are generally taught in one of three ways — in a traditional class but with an extra teacher, an approach known as collaborative team teaching; in small classrooms with 6 to 12 students; or by being pulled out of a traditional classroom to receive extra services like speech or physical therapy. Charlene Carroll-Hall, whose son Traé is a high school freshman, said she thought the goal of integrating special education students with their peers was laudable but worried that students could slip through the cracks. “My son had to fail at a regular zoned school first before I could get him the help he needed — they just put him in there and didn’t expect much and didn’t care,” Ms. Carroll-Hall said of one school her son attended. In schools more focused on special education, she added, “he could finally catch up; they expected him to actually learn something and they knew how to teach it.” He now attends Queens High School of Teaching, a regular school, where he has a part-time aide. Some principals say they are particularly nervous about having more demands on them at a time of budget cuts, though public money is provided to cover special education students’ services. For example, Ms. Gaines Pell said, if she decided midyear that a student should have a dedicated aide for reading, she wondered whether the school could secure the money for it. Others are concerned that they may overlook a nuance in the educational plan that states which services a student should receive. City school officials have stepped up education efforts and are stressing proper reporting methods after a third-grader who was a victim of chronic bullying at a West Baltimore elementary school said she wanted to kill herself. The city teachers union is also pledging to work with the Baltimore branch of the National Association for the Advancement of Colored People to hold a bullying-prevention program at Gilmor Elementary School, the site of the incidents. 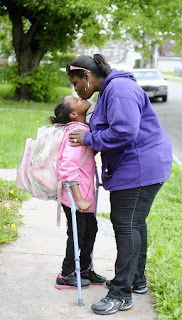 The actions come after complaints of severe bullying at the school, which included a third-grader who has cerebral palsy saying that she suffered repeated verbal and physical abuse. The girl's mother said the 8-year-old wanted to kill herself by trying to jump from a second-story window after students beat her. The city school system says the classroom teacher reported that the child was not at a window but made a comment that she wanted to commit suicide. Maryland has tried to encourage parents to report bullying, but it is unclear how fully the efforts have been embraced in Baltimore. Beginning four years ago, every jurisdiction was required to provide parents with a form to complete if they believe their child is being bullied. Schools are required to investigate, and parents can bring concerns to top administrators in the district or to state education leaders if they believe the issue hasn't been addressed, said Charles Buckler, director of student services and alternative services for the Maryland State Department of Education. "Baltimore City has historically reported low turn-ins of those forms," Buckler said. "It is hard to imagine a school system of that size would not have more reported bullying going on." The system posts the form on its website. In other districts, the forms are sent home to parents at the beginning of each school year. Jonathan Brice, executive director for student support for city schools, said parents still call schools to report bullying to teachers and school administrators. This school year, there have been 105 incidents of students suspended for bullying in the district, compared with 79 last year, he said. He attributed the increase to greater awareness and training. "It is not that city schools are not following through and addressing bullying," Brice said. Gilmor Elementary's principal, Ledonnis Hernandez, has met with parents and faculty in the past few days to reiterate the school system's protocol on bullying, and an automated phone call denouncing bullying also went out to parents, Brice said. He said school officials are reminding students that if they see bullying or they are bullied they should go to adults in the building, and that "students are going to be given the appropriate consequences for that behavior." School officials said three students have been suspended for bullying since Shaniya Boyd (pictured), an 8-year-old student at Gilmor, was attacked; one of those students is accused of attacking her. Overall, 17 Gilmor pupils have been suspended for bullying this year, Brice said. Marietta English, president of the Baltimore Teachers Union, said that while there has been bullying at the school, she doesn't believe it is a widespread problem there. "Kids do fight," she said, and teachers are working to address it. In response to allegations made by Shaniya's mother, Geneva Biggus, that the bullying was never addressed by school leaders despite numerous reports and meetings, city school officials said they have followed the system's code of conduct. The code outlines the protocol of addressing bullying incidents, placing most of the responsibility on parents to report the allegations and on school principals to handle the incidents internally. But the school system's parent advisory board chairman said Wednesday that the protocol might have to be reviewed. Dennis Moulden, chair of the school system's Parent and Community Advisory Board, said Wednesday that the process might have failed Shaniya and other students who are bullied. "It appears that the system for reporting it isn't as leakproof as it should be," Moulden said. "I realize that the procedure that was outlined in the code of conduct may need to be revisited because it doesn't seem to be working." Moulden said the parent advisory board pored over the bullying section of the code of conduct when members helped write it two years ago. But he said it appears that in most cases of bullying — and he said he has been contacted about many — the outcome ultimately depends on how seriously school leaders handle the situations. "I know of [incidents] that have been handled well, and I know of others that were pushed under the table where the principal just thought it was going to go away," he said. "It's been a persistent thing, and it depends on the principal." Brice said central office officials have worked with Gilmor's principal to install a plan that would enable her to better monitor and respond to incidents of bullying. But he said an investigation determined that the school took appropriate measures in Shaniya's case. Parents of Gilmor students said Wednesday that families are as responsible for children's behavior as school leaders are for overseeing it. Chanel Jones, whose daughter, Talia, is in second grade at Gilmor, said, "The children are just doing what they see at home." Jones said Talia won't be attending third grade at Gilmor next year, because she doesn't "want to jeopardize her education." Shandia Johnson, who has a second-grader at Gilmor, agreed that the behavior problems at the school probably are a result of poor parenting. "It really starts at home, and it's but so much the school and teachers can do," she said. "But the question is, what are they going to do about it? Why did it have to be in the news for them to say anything? Why did it get to the point where that little girl needed to go to a window?" "Heavy Load," the award winning documentary about the English punk rock band, is now out on NTSC DVD. The film was first shown in the US on IFC and premiered at SXSW in 2008. Since then, it has been shown at film festivals around the world and screened at cinemas in the UK and shown on the BBC. Heavy Load are Lewes' answer to the Ramones, a punk band subject to the usual inflammatory mix of ego, fantasy, and desire. They're also, uniquely, made up of musicians with and without learning disabilities. The bands' survival is a precarious negotiation between two different worlds: on the one hand the institutional timetable of day centres, work placements and social workers; on the other the chaotic slacker life of rehearsal rooms, studios and gigs. Home life and band-life; from invisibility to stardom of a sort and back again. But this is not a film about a young band on the road to making it. Specializing in thrash covers of late 70's punk - or punk versions of recent pop, Heavy Load are unlikely to have a top ten hit. Shot over two years as the band record their first album, the film is a comedy of conflicting ambitions, as the band move out of the ghetto of disability club nights to test whether their dreams can survive in the mainstream. 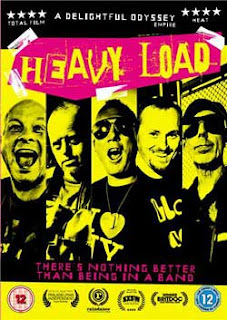 You can get a copy of the DVD which includes extras such as their trip to NYC from http://www.heavyload.org/. To find out more about the film, see http://www.heavyloadthemovie.com/. 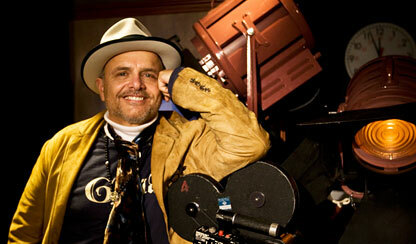 Actor Joe Pantoliano (pictured), who won an Emmy as the unpredictable Ralph Cifaretto on The Sopranos, is taking his talent -- and his personal mission to fight the stigma of mental illness -- to the other side of the camera as producer and director of the documentary No Kidding, Me 2!, an intimate look at the journeys of Americans living with mental illness. Pantoliano is also the founder of No Kidding, Me Too!, a non-profit organization "whose purpose is to remove the stigma attached to 'brain dis-ease' through education and the breaking down of societal barriers." Pantoliano spoke to Parade.com about his experience filming the documentary (available today via Amazon.com's CreateSpace), the ways in which his life has been affected by clinical depression (he was diagnosed in 2005), and how he hopes to change the way the world sees mental illness. No Kidding, Me 2! focuses on the personal journeys of individuals living with mental illness. What has your experience been like? "When I was diagnosed -- and I didn't know about the stigma of mental disease -- I was relieved. My immediate reaction was as if I'd hit the lottery. Thank God it wasn't my fault. What I couldn't fathom was, 'How was it possible that, in the height of my success, marriage, family, money in the bank -- everything was going right -- why was I feeling so bad? Why didn't I even want to live anymore?' And my thought was, 'What more do you need? What's it going to take, Joey?' I always thought that by accumulating fame and things, that those were just the ticket to fill up that emptiness in me. Now, in dissecting my life, I realize it was a genetic part of me for sure." People often go years without a diagnosis. Was there an event in your life that caused you to say, "I need to find out what's wrong with me"? "I loved Charlie [actor Charles Rocket, who died in 2005]. And the way that he took his life, and the way that I had only spoken to him two days before, when we made plans for Thanksgiving. We were hashing over old times, the good ol' days. And talked about getting together for Thanksgiving. "I was in pre-production on [ Canvas] and so, as a producer, I had to be there ten days earlier than if I was just acting in the thing. So two days afterwards, I was shocked; Nancy, my wife, called to say that Charlie was dead. When that happened, it just knocked me off my center. And I felt a great feeling of empathy that literally scared the sh-- out of me because I thought that Charlie had found the answer, and that that was the answer for me too." How did you seek help? "I take Lipitor for cholesterol, so I've got to go every three months to see my doctor to make sure my liver is all right. While I was there, my doctor wanted to know how I was doing. And I told him that I was tired all the time, that I was sad all the time -- that I couldn't move. I couldn't change. I was in the fetal position most of the day. I couldn't even brush my teeth. If there was some magical elixir that was invented that could take all this away and it was sitting six feet away from where I lay, I wouldn't have the energy to get up and get it. He recommended that I see a psychiatrist. And I did." What was it like growing up in the Pantoliano household? Looking back, were there signs of mental illness? "I've been in some form of therapy since I was 19 years old. My sister has the same disease that's inside of me and was inside of my mother. I never thought we were crazy, I just thought we were Italian, and that everybody who was Italian was just like us. You know, people yelled and we screamed and we carried on and we said what we said and that was the end of it. "I did a book in '03 called Who's Sorry Now?, looking at my family history and the first 18 years of my life, where, in writing that book, I was making peace with my mother, but I also thought she was responsible for her misery and the misery that I lived with in my home." Your mother had a profound affect on you. "My mother adored me. She worshipped the ground that I walked on. There was nothing that her Joey couldn't have, shouldn't have. She worked four jobs, she ran numbers. She was the provider and the leader of our family. My mother could get blood from a rock. We were the only people I knew who were getting two Welfare checks a month. My mother was a hustler, and I am a hustler. And so, there are a lot of positive attributes that this disease provides for me. I totally believe that my success is wrapped around that." You're a husband and father now. How has your family been affected by mental disease? "I was dyslexic and had attention deficit disorder that my two younger kids are treated for. That's the reason we moved to Connecticut. The state of Connecticut provided an education that was overwhelmingly successful for both of these kids. "Isabella, who's 11 now, she understands that this is a disease, and she's treated for it in class. The teachers give her special compensation. And Dani, Dani's graduating this year. She just turned 18 yesterday. She's going to be able to get as much time as she needs in college." It's hard to imagine anyone who hasn't been affected by mental illness -- whether they know it or not. "This is the rule, not the exception. Because we're so stigmatized by it, we're afraid to tell anybody. It takes usually 8 to 10 years to get diagnosed with this thing, because of the shame." Despite the progress in diagnosing and treating mental illness, that shame still exists. What can we do to change that? "The crack is just opening where people are actually opening up to talk about this. What I'd love to see finally happen is have mental health education begin as early as the first grade." The documentary discusses, in intimate detail, people's experiences with mental illness. Is your hope that its frankness will open a dialogue among viewers? "That's the message of our organization. With No Kidding, Me Too!, we use our celebrity to shine the light on the dark corners of stigma and shame and prejudice. Simply, we're an organization, and our purpose is to remove the stigma attached to mental illness through this education, the breaking down of societal barriers. Our goal is to empower those with a brain disease, get them to admit it. You can't get better until you can talk about it freely." What progress have you witnessed in terms of recognizing the importance of mental health? "The military invited me to bring this documentary for Suicide Prevention Week to show the GIs because they are stymied. They're just now realizing the power of surrendering to your feelings, that depression can kill you. And now, in the military, they're actually teaching in basic training to talk about your feelings. That it is bravery to share your most intimate traumatic events and that by doing that they become less traumatic. And by doing that they just become a part of your past that you can visit." What has Hollywood's reaction been to your organization, No Kidding, Me Too! (nkm2.org), and the documentary? "Their reaction is, 'You're doing such important work, Joey.' I'm here now trying to put together PSAs for the opening of this movie. This movie is going to be available exclusively on Amazon.com. You can push a button, you can buy it and you can find out that you're not alone." What advice do you have for people living with mental illness, who may be feeling alone or ashamed? "What I would say is, 'You're not alone. There is an answer. There's a solution. There are things that you can do. Instead of staying in bed, turn on your favorite music and dance.' It's hard to feel depressed when you're tap dancing." What is it that you want viewers to walk away with after watching the documentary? "We want people to turn to each other and start the conversation. Having been diagnosed with mental disease is the greatest single thing to ever have happened to me." Scores of complaints have been made in recent years against adoption agencies by people claiming they were inadequately informed or ill-prepared for problems their children turned out to have. Many state laws and the Hague Convention now require agencies to disclose “reasonably available” records. But it can be unclear, especially in international cases, how assertive they are expected to be in getting such information. But when they decided to adopt, the Harshaws told their agency they could care only for a child with minimal health problems and “a good prognosis for normal development,” according to notes in the adoption agency’s paperwork. They rejected one child because he had abuse-inflicted burns. But when a toddler in a Siberian orphanage appeared to fit their criteria, they brought the boy, Roman, home. “ ‘A beautiful, healthy, on-target, blond-haired boy’ was what they had quoted to us,” Ms. Harshaw said. After the adoption in 2004, Roman began showing “uncontrollable hyperactivity” and aggression, Ms. Harshaw said. He has threatened their 5-year-old biological daughter with a steak knife and a two-by-four, and held her underwater in a pool. Their 13-year-old biological son has felt so much stress that he has required therapy. Therapeutic programs have ejected Roman for kicking, biting, hitting and, most recently, on his 8th birthday, pulling out three of his teeth using a pen cap, fork or spoon. Doctors finally diagnosed fetal alcohol spectrum disorder, brain damage and neuropsychiatric problems in Roman, whose I.Q. is 53. He was recently placed in an institution and is not expected to ever live independently, one of his doctors said. The Harshaws are suing the agency, Bethany Christian Services, seeking compensation for the care Roman will need. 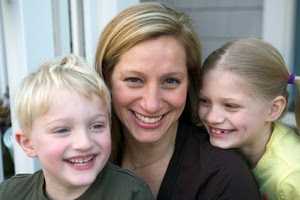 After Roman’s problems were diagnosed, the agency offered to end the adoption, to try placing Roman with another family. The Harshaws refused. “He’s not a dog; you don’t take him to a pound,” Ms. Harshaw said. Bethany, which calls itself “the nation’s largest adoption agency,” disputes most of the claims. No organization tracks the number of cases against adoption agencies, and academics and industry officials say many are settled out of court and sealed, so the outcomes are unknown. But these days, “a far greater percentage of these wrongful adoption suits relate to international adoptions,” said Marianne Blair, a University of Tulsa law professor. Issues of disclosure have drawn increasing attention in recent years. Lawsuits erupted in the 1980s over domestic adoptions in which histories of abuse and other problems were kept from adoptive parents. As a result, many states enacted disclosure laws, followed by similar requirements in the Hague Convention, which apply to countries that ratify the treaty, as the United States did in 2008. Russia has signed the agreement but has not yet ratified it. Those regulations were developing as the Harshaws’ adoption was proceeding, and at most agencies, “the atmosphere was definitely an emphasis in getting what could be obtained and making sure that they disclose that,” said Joan H. Hollinger, a law professor at the University of California, Berkeley, who is serving as an expert witness for the Harshaws. Agencies were also focused on “preparation of adoptive families for what they might encounter,” Professor Hollinger said. Bethany says it clearly advised the family that children from Russia could have problems, including serious ones, and that records might be inaccurate. In a deposition, the caseworker acknowledged she had said that the doctor, Michael Dubrovsky, visited the orphanages to “see the children” and review pictures, videos and medical information. The agency says the Harshaws misinterpreted that to mean Dr. Dubrovsky had examined Roman. In a deposition, Dr. Dubrovsky said he had never seen Roman, had not practiced medicine for years and was a facilitator for Bethany, not a medical screener. The agency also suggests that the fetal alcohol syndrome was unlikely to have been detected before the adoption, noting that the Harshaws did not receive that diagnosis until two years later. Mr. Zausmer said the agency did not conceal information and provided a translated synopsis of the Russian medical records that was standard at the time. “We don’t believe that there was anything in the Russian records that would have materially affected any adoption decision,” Mr. Zausmer said. The Harshaws hope the institution can stabilize Roman enough to send him home; either way, he will need extensive lifetime care. A New Jersey Appellate Court ruling handed down on April 26 may free a Franklin Township man sentenced to five years in prison for growing marijuana plants to treat his Multiple Sclerosis. John Wilson's attorney James Wronko confirmed the ruling saying, "They have stayed the sentence." The court ruled that Wilson, 37, should be granted bail and released to his family if he can meet the court's requirements for release. While his family is hopeful, they have grave concerns as to Wilson's declining health. Wilson spent three weeks in the Somerset County Jail after his February conviction, then a week in a Trenton transfer facility and had just been moved to a state prison complex in southern New Jersey when the appellate court finding came down. 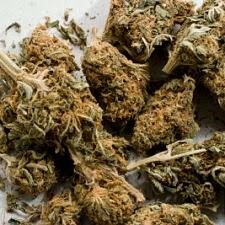 Wilson's troubles began after a New Jersey National Guard helicopter pilot spotted 17 marijuana plants growing behind his home. He was arrested and charged with manufacturing drugs, a felony, manufacturing marijuana in the second- and possession of hallucinogenic mushrooms in the third degree. He was found not guilty of the felony charge, which could have sent Wilson to prison for fifteen years. 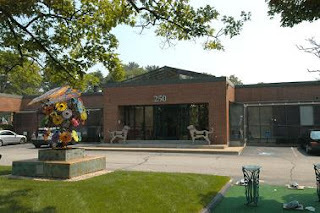 During trial, Wronko was not allowed to mention to his client's jury that Wilson suffered from Multiple Sclerosis and was not allowed to introduce testimony as to the medical benefits cannabis afforded his client. It all but sealed the man's judicial fate. Wilson's case attracted extensive media attention and support from the Coalition for Medical Marijuana New Jersey as well as State Senators Raymond Lesniak and Nicholas Scutari who have petitioned the Governor to grant Wilson an Executive pardon. Six years ago, Randy Walther, a Realtor with Coldwell Banker Elite in Fredericksburg, knew nothing about universal design. Then his adult son suffered a spinal cord injury, confining him to a wheelchair. During the process of remodeling his home to accommodate his son's needs, Walther became engrossed in universal design, the concept of creating products, buildings and environments that meet the needs of everyone, not just the disabled or elderly. Today Walther offers universal design consultation as a service in his real estate business. "When it's staring you in the face, you make it work," Walther said. "Once you learn more, you realize some of the things put in place for a person with disabilities can be useful to anybody." John Salmen, president of the Takoma Park-based Universal Designers & Consultants Inc., has studied universal design for 30 years. He has worked with AARP and other agencies on the concept of "aging in place," or making modifications to a home today for possible lifestyle changes later. "People want to stay in their homes longer," Salmen explained. Although aging baby boomers have fueled discussion about universal design for years, Salmen said that only recently has it gained traction with builders and product makers who now promote these features as amenities instead of restrictions. Winchester Homes built a universal design home in the Clarksburg Village community in Montgomery County. The exterior of the home, which sold last August, looks like any other in the neighborhood. Cynthia Herberg, director of marketing for Winchester Homes, said the company offers a Design for the Ages package, which anticipates the needs of multigenerational households. The kitchen in the Clarksburg home features an island with 5-foot clearance for wheelchairs or strollers. Countertops vary in height, and controls are mounted on the front of appliances. Winchester also offers buyers a universal design checklist that includes options like curbless showers, toilets centered 18 inches from the side of any wall, lever handle water fixtures, open pantries with easy access and obstacle-free wide walkways. "If you look at the list of features, such as first-floor master bedrooms, you realize many people can benefit from those," Herberg said. One example in the Walther household is the lift he installed for his son. It's proven quite useful in transporting large amounts of groceries. The key, Salmen said, is realizing that universal design works for everybody. "It can be low-cost too. It depends on a person's needs," he said. "Some people may have to retrofit. Others may need only simple solutions, like changing all knobs to levers or buying different appliances." HICKSVILLE, N.Y. — When Amy Palmiero-Winters (pictured) was in high school, she would work the closing shift at her family's drive-in restaurant in Meadville, Pa., then head out for a run, with her friend Stacy Hatzo driving alongside. "We would talk about anything and everything, solve all the world's problems," Hatzo says. But never could they have conjured the story line that has Palmiero-Winters, now a 37-year-old divorced mom, still running in the late-night hours, her two sleeping children at home with a babysitter, her prosthetic lower left leg and determination carrying her beyond limits anyone would dare suggest. At 9 a.m. on Jan. 1, Palmiero-Winters finished first overall in the "Run to the Future" 24-hour race in Glendale, Ariz. — and crossed a barrier. By covering 130.4 miles in a day's time, she became the first amputee to qualify for a U.S. national track and field team. She will compete in the 24-hour world championships May 13-14 in Brive, France, with 11 teammates. "What it means to me goes beyond what I could express with words," says Palmiero-Winters, who recently won the 2009 Sullivan Award as the nation's top amateur athlete. What it means to sports history is that Palmiero-Winters has done what eluded South African sprinter Oscar Pistorius, the double amputee who tried to qualify for the 2008 Summer Olympics. "It's sort of like Jackie Robinson breaking the racial barrier in professional baseball," says Roy Pirrung, president of the American Ultrarunning Association and the U.S. team leader for worlds. "I think it's that high of an impact." Pistorius' attempt was clouded by debate over whether his carbon-fiber "Cheetah" limbs gave him an edge. Before naming Palmiero-Winters to the team, USA Track & Field made certain that international officials didn't have similar concerns, USATF spokeswoman Jill Geer says. Palmiero-Winters has a schedule that could overwhelm the most hard-core ultrarunners. IIn June, she plans to compete in the Western States Endurance Run, 100 miles of trail running through the Sierra Nevada (she is the third amputee to qualify). In July, she will run the Badwater Ultramarathon, a 135-miler in California from Death Valley to Mount Whitney — spanning three mountain ranges — in temperatures reaching 130 degrees. "It helps me show people that we all face obstacles," says Palmiero-Winters, who lost her lower left leg after a motorcycle accident at 21. "Me being out there helps them see that you can overcome (them)." She discovered running at 8, when, in borrowed shoes she had to stuff with toilet paper for a better fit, she crossed her first finish line. In last place. "I didn't feel bad because I came in last," she says. "It sparked something inside of me." She ran to keep up with her two older brothers. She ran track and cross country in high school. She ran while making deliveries for the restaurant. "Every place she went, she'd run," says her dad, Larry. After a car pulled into her right of way, crushing her left foot and ankle in the 1994 motorcycle crash, she tried everything to keep her leg intact for running, enduring skin and artery grafts among nearly 30 surgeries over three years' time. Her ankle began to fuse and her foot was barely functional. She opted for an amputation, but not before she ran a marathon. She finished in a little more than four hours. "When I had my accident, they said I'd never run again," she says. "It was more of proving them and myself wrong." Palmiero-Winters had run her first marathons in the months before her accident. 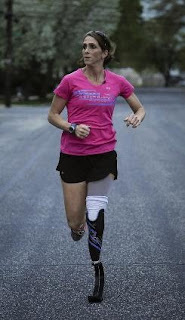 After the amputation, she set out on a path that's taken her through countless marathons (her personal-best finish is 3 hours, 4 minutes, 16 seconds), triathlons, Ironman triathlons and, in the last two years, some of the world's most extreme races. She competed in 10 ultra-distance races last year, including the Heartland 100 Mile, where she finished first among women. "She's just built for them," Hatzo says. "She can run forever." Only in recent years has Palmiero-Winters had prosthetic limbs built to match her ambitions. She heard about Erik Schaffer, owner of A Step Ahead Prosthetics (ASAP) in Hicksville, at a race, and three years ago she quit her job as a welder in Meadville and moved to Hicksville to train and work for him. He provides her running blades, which can cost at least $25,000 each. She is sports program director at ASAP, where the motto is "Live Life Without Limitations," helping clients that range from small children to elite athletes imagine and reach their athletic goals. She says if she could "rub the magic genie lamp and take it all away and have my leg back, I wouldn't. Because my life is much better the way it is." She gives motivational speeches at schools. She runs marathons pushing wheelchair-bound children, trying to inspire them to push beyond their obstacles. "She's twice the person she was before she lost the leg," says her mom, Pat. Palmiero-Winters' ever-expanding athletic aspirations constantly present Schaffer with new design challenges. For the 24-hour race at worlds, Schaffer designed a blade with a split down the middle to help her handle the impact of the turns on the 1,200-meter circuit course. He also has precisely calibrated the stiffness of the blade to properly bend with the force she will exert as she attempts to travel more than 150 miles (more than 6 mph) in the race. Palmiero-Winters ran the Badwater course last summer to prepare for this year's race but stopped just short of 100 miles because the heat from the road rose through her prosthetic and caused third-degree burns on her residual limb. Schaffer has designed a cooling system, using water that will drain, for this year's race. For Western States, he has extended the piece of car tire he normally attaches to the foot of her blade to give her stability and traction as she runs downhill. Bob Otto, an exercise physiology professor at Adelphi University in Garden City, N.Y., has designed her training program for worlds. "She has such focus that it can actually lead to her demise," Otto says, noting that Palmiero-Winters ran 10-12 miles last summer after the third-degree burns developed. "At the expense of her body, she'll continue to push. That's what makes her successful. We try to temper that." Many ultrarunners train by doing 20- to 50-mile runs on back-to-back days. Palmiero-Winters cannot, because she must give her residual limb a rest from the pounding and friction that running inflicts. To make up the mileage, she has been doing one 70- or 80-mile training run a week, leaving her house at 8 or 9 p.m. and finishing just before starting work the next morning. "I don't want my kids to suffer because of my training," she says of son Carson, 6, and daughter Madilynn, 4. "I give up a night's sleep. That's good training, too, because in a 24-hour race you don't sleep." You run all night — and maybe you solve at least some of the world's problems along the way. George Racette, an 80-year-old former industrial research and design specialist, is reading about relativity. "Space and time seem like straightforward ideas," he reads aloud in an even, avuncular voice. "Or so it seemed to everyone until 1905." Racette sits in a soundproof booth, black headset clamped over his ears, a copy of College Physics: A Strategic Approach, open to page 899. Just outside the booth is his "director," 70-year-old Richard Tave, a former chemical engineer whose task, this morning, is to follow the text while Racette reads, making sure he captures every word of the book - including graphs, photos, captions and marginal notes - accurately. "There's a photo on this page," continues Racette, while Tave tracks along in his own copy, heavily annotated in pencil. "It's captioned 'turtle with a GPS' and shows a turtle with a harness on it." Racette and Tave, along with hundreds of volunteers across the country, spent several hours last week turning books - from second-grade social studies workbooks to medical-school anatomy texts - into audio recordings that will be used by the blind or dyslexic. The national Record-a-Thon, hosted by Recording for the Blind & Dyslexic, marries a timeworn, labor-intensive practice - reading aloud for those who can't read for themselves - with 21st-century technology. Once the books are recorded - a hefty volume such as College Physics can take five months - users can either order CDs from RFB&D's library of 59,000 titles or download them and listen to Clinical Behavior Therapy or When Slavery Was Called Freedom on an iPod. The 62-year-old RFB&D was founded to record college texts for World War II veterans, blinded or visually impaired from war injuries, to enable them to take advantage of the GI Bill, said Michael Kurdziel, the organization's chief of programs and services. Now the target audience has changed. More than three-quarters of RFB&D's users are children and adults with dyslexia or other reading disabilities. While just 0.4 percent of the U.S. population is legally blind, dyslexia and other reading disabilities affect as much as 15 percent of the population, according to the National Institutes for Health. For people whose dyslexia causes them to mix up letters or words, miss suffixes and prefixes, or read slowly and haltingly, "the audio text makes a big difference," says Jo Anne Simon, president of the International Dyslexia Association's New York branch. "It's quicker. And the reader isn't making mistakes. The recorded text is a more accurate representation. So [the listener] is getting the message, which is ultimately the point." For 9-year-old RJ Taschek of Marlton, the printed word was usually cause for tears. Irene Taschek, who homeschools her son, noticed that he routinely skipped words or lines when he read. Sometimes he reversed letters. She tried borrowing audio versions of children's books from the library, so he could listen while he read, but the narrators spoke too fast, and RJ couldn't keep up. "We were constantly rewinding the tapes. He became frustrated. I was so concerned about him hating reading. To see him struggling with it broke my heart." Then another mother told Taschek about RFB&D's audio library, which includes children's classics such as The Boxcar Children and the Harry Potter series along with textbooks. A special playback device allows users to slow down the narration, skip backward or forward easily, or bookmark their place in the text. "It became a key tool for his reading to improve," says Taschek of her son. "When he was diagnosed with dyslexia at age 7, he was graded at a 1.2 reading level. Twelve months later, he was at 3.5. Now he's almost done his third-grade year and he's reading at a fifth-grade level. "It's still a struggle for him to read. He struggles with phonics. But there are no longer tears; there's no longer frustration." Mary McDermott (pictured) has worked at RFB&D's recording studio in King of Prussia for 17 years. When she started, volunteers recorded books on reel-to-reel tapes; later, they used four-hour cassettes. Patti Lariccia, 56, remembers those days. She began to lose vision at age 9, due to an eye disorder called uveitis. By high school, she could no longer read print; using a magnifying glass just made the letters blurrier. "I had a great, big, old-time reel-to-reel tape player in my bedroom. It was ancient and cumbersome. The tape would get tangled." Still, those audio recordings cracked open the world of literature for Lariccia. "I remember listening to Great Expectations and The Great Gatsby. It got me interested in pleasure reading. I started listening to things I didn't have to read for school." By the time Lariccia was at East Stroudsburg University, majoring in psychology, some of her textbooks were available on cassette. If a professor assigned articles, she paid classmates to read them aloud to her. Today, Lariccia, who lives in Clifton Heights, listens daily to audio books; she favors popular fiction by Lisa Scottoline and James Patterson. "Now that the digital machines and discs are available, it's a better system," she says. "I usually have at least one book going. I like being able to talk about books with my friends who are fully sighted. It allows you to put some normalcy in your life." Demand for audio books far outstrips the supply; only about 5 percent of existing titles are available as audio recordings, says Simon of the International Dyslexia Association. That's why she's an enthusiast of new technologies such as text-to-speech: software that can convert written text to a digitized voice. But Kurdziel and some users of audio books fear something may be lost in that translation. Computer-generated voices, he points out, can't yet capture the nuances of poetry or the inflections of various characters in a Shakespeare play. "There's something very intimate about that human voice being recorded and listened to by thousands of users." Back at RFB&D's studio, on the first day of the Record-a-Thon, Marcia Zanger takes the director's chair, opening a copy of Fundamentals of Human Resource Management and setting up the computer to record Tave's reading. Zanger, 77, of Havertown, has volunteered here for 13 years. "Some of the books we read are boring and difficult. Especially the philosophy books" with sentences that meander on for whole paragraphs, she says. "But no matter how boring the book is, you put expression in. You do not read in a monotone." Tave launches in where the last reader left off - a section on "Separating and Retaining Employees." Zanger stops him with a reminder to include the marginal note; she rewinds a few seconds, and he begins again. "Discharging employees can be very difficult -" he reads in a mellifluous voice. COLORADO SPRINGS — Wilson Buswell (pictured) has cerebral palsy, can't talk and answers only yes-or-no questions: a blink for yes, a stare for no. But Buswell has become a powerful communicator to a handful of students studying to become effective special-education teachers. Buswell, 30, is co-instructing a course at the University of Colorado at Colorado Springs on how to teach students who have significant support needs. His presence in the classroom every week provides a valuable real-life lesson in how people with disabilities can be included — and even teach a thing or two. "Just because someone can't speak doesn't mean they can't learn," said Mallory Barber, a first-grade teacher at Explorer Elementary School in Colorado Springs who is working toward her master's degree in education. Though federal law requires students with disabilities be placed in the least restrictive classroom environment, a movement has been growing to fully include students. That is the mission of Buswell's co-instructor, associate professor Christi Kasa- Hendrickson, who believes inclusive education is a social-justice issue. "There is such value in diversity and such value for people with disabilities in class," said Kasa-Hendrickson, who travels the country helping schools develop systems to fully include children with disabilities alongside their nondisabled peers. It was natural, then, for Kasa-Hendrickson's college course to be a model for inclusion. "I'd always thought that if I am going to teach a class about a group of people that I should have a member of that group teaching it with me," she said. "It's really about having representation of a minority group that doesn't get heard or seen very much." Buswell, a high school graduate with 26 college credits, doesn't lecture. He presents PowerPoint lessons that detail his life experiences and asks students in the class to mull how they would include him. "I'm in charge of teaching all of the strategies and research part," Kasa-Hendrickson said. "Wilson does a lot of the personal perspective — what has his life been like, what is communication like for him, how does he deal with folks in the community and what is cerebral palsy like." Buswell's parents are well-known in Colorado for their disability-rights advocacy and for their fight for their son to be fully included in Colorado Springs District 11. His mother, Barbara Buswell, is executive director of Peak Parent Center, Colorado's federally designated parent training and information site for families of children with disabilities. On a recent Wednesday, Buswell sat in his wheelchair facing the class with his sister, Bronwen Buswell, 27, at his side. She would occasionally speak for him, feed him, stretch out his contorted arms and wipe away saliva. Buswell had created a PowerPoint presentation by painstakingly typing out words with help from his sister to explain different activities in which he participates — volunteering, going on hikes with his family, opening presents at Christmas and attending rock concerts. With help, Buswell tapped an electronic device to change the PowerPoint slides on the screen. "You have to participate in everything or you won't participate in anything," Buswell says in one of his slides. He then asked the graduate students to think of three classroom activities in which he could be included. Students suggested a discussion about a book or film with "yes" or "no" answers or letting Buswell help make decisions in creating a music video or planning a concert. "Presume competency," Kasa- Hendrickson said, reminding students of a key tenet for creating an inclusive classroom. Teachers also should work to establish a community within the classroom, create adaptations to help that student learn and tackle any challenge with optimism and creativity. "We just don't have a lot of effective results from segregating classrooms," said Kasa-Hendrickson, citing a soon-to-be-released federal study that shows the biggest indicator of growth in reading and math for students with disabilities was time in general-education classrooms. "To me, all kids should be educated together," she said. "I see it as a slow social movement." The first challenge is getting teachers to drop their fears of students with severe disabilities, she said. That can be difficult — and that's why she introduces them to Buswell. "Students are really unsure about being around a person with significant disabilities," she said. "They don't know how to act; they're nervous." One time, a student of hers burst into tears and ran from the classroom when she first saw Buswell. Kasa-Hendrickson coaxed her back in and asked her to observe Buswell's interactions. Kasa-Hendrickson seeks his input by asking Buswell "yes" or "no" questions. Students also have noticed Buswell's sense of humor when he laughs at Kasa-Hendrickson's technical problems that sometimes stall class. "Lots of people have a guest speaker, but I thought a long-term presence will create change," Kasa-Hendrickson said. "One of the things I am very committed for them to do is to learn how to speak and interact with someone in a very typical and normal way. To learn to do that takes time." "I am hoping that by the end of the class, they will decrease their fear about being around people with disabilities and they learn tons of strategies of how to include kids and how to communicate with someone who can't talk," she said. Julia Smith, a teacher at Children's Ark in Green Mountain Falls, said being exposed to someone with such significant disabilities has been eye-opening. "I've seen how capable and talented he is," Smith said. "I've learned asking him questions is OK. For him to say, 'I need more time to answer' and 'This is how I will communicate,' that is huge." Spending and programs are not tracked, nor coordinated -- creating a system seemingly ripe for waste and ineffectiveness. When it comes to providing disabled, infirm, and elderly people with what they need to live at home instead of in an institution, San Francisco is extraordinarily generous. The city spent $736 million last year, up from $645 million the previous year, according to a recent Controller's report. Of that, $218 million comes from the city's general fund, with the rest routed through city programs from the federal and state government. This does not include the $160 million spent on long-term care services last year at Laguna Honda Hospital. This money is spent to further the noble cause of helping people emulate normal lives as much as possible in spite of disabilities. But routing of taxpayer dollars to what are called community-based long-term care services is not routinely tracked by the city. Services are spread over multiple non-profit and city agencies with different missions and different criteria for accepting and serving patients. The city has spent the better part of a decade studying the issue of better coordinating these services; but public officials are still scratching their heads about how to get this done. The report does not describe any waste or other failure associated with the lack of coordination. But experts told the Snitch that lack of coordination has been considered an important problem in government efforts to help the disabled live at home. "What will happen is, well-intentioned people and good staff meet a niche need," said Donna Calame, executive director of the San Francisco In-Home Supportive Services Public Authority, which oversees a state program that pays for workers to help disabled people in their homes. "Then there got to be all these niche needs that arise over a period of years. And they stay separate out of a combination of inertia and institutional preservation." Services aimed at helping mentaly disabled people, AIDS patients, Alzheimer's sufferers, and other people live independently have emerged as advocates for different groups have demanded help. But "the reality is these people need the same kind of service," Calame said. "A person in a wheelchair who cannot get out of bed, whether they're a 10 year-old with a developmental disability, or a person with HIV who's lost physical function, or an old person who's getting arthritis, they're all ending up with the need of someone who'll help them get out of bed, bathe, get dressed, and so on. But each of these people might be served by a different department, or a different funding mechanism, and it's all chopped up." "There exists no universal best practice, or consistent and fiscally measurable approach, to defining "long term care services." State and federal programs, academia, as well as the San Francisco Long Term Care Coordinating Council (LTCCC) employ different definitions for what comprises LTC services and populations, or they leave it broad and open to interpretation. The City's fiscal systems are not currently equipped to replicate this analysis. The City's budget documents and accounting system (FAMIS) are not currently designed to report this information. Department staff generated spending data for this analysis using their unique internal systems and recordkeeping efforts. This proved a time-consuming process - repeating this data collection and analysis would require an advance commitment of significant staff time from the departments involved, notably HSA and DPH." When pro-surfer Clay Marzo (pictured) rides the waves off Maui's coast, it's hard to imagine that a man so gifted in the water could struggle so much on land. Beyond a few words, Marzo, 20, finds it hard to hold a conversation. Ask him a question, and finding an answer seems to cause him pain. Chat with him for half an hour, and the words never never flow any easier, because Marzo has autism. He has a milder form known as Asperger's syndrome. Labeled a disability, Asperger's may help to explain why Marzo is so good on a surfboard. Since he was a little boy, when his difficulty in communicating became evident, Marzo zeroed in on water. He wanted to be near the water, to be in it -- a focus so intense that it was actually obsessive, according to his mother, Jill Marzo. Obsession is part of Asperger's. In the water, "he was comfortable in his skin," said Jill Marzo. "Out of the water, he is not comfortable, even today. In the water, it's like he can breathe." Marzo spends hours a day in the ocean, year after year. Some Asperger's obsessions, such as fixating on train schedules or "Star Wars" or lightbulbs, can disrupt. But Marzo's water obsession evolved into surfing, where obsession is required to succeed. Marzo's obsession has made him a star surfer. He's a favorite with surfing magazines, is sponsored by Quicksilver apparel and earns an income that reaches into the six figures. But on dry land, says his mom, Marzo's a fish out of water, unable to process easily anything that takes quick thinking. He struggles in getting around, meeting strangers and answering questions. It's too much too fast for his brain to take in, and the attention that accompanies his surfing fame makes for an uncomfortable experience. "It's got to be more simple," said Marzo. "You know? Simple. Surf and eat and sleep, you know? My three top things." That might sound simple enough, but it's never simple to live with Asperger's. For Marzo, though, it just happened to work out: He needed the water, and the sea was there to catch him. A Northern California couple with family experience in learning disabilities is giving USC $10 million to help create a campus center to aid students with dyslexia, attention deficit hyperactivity disorder and other learning difficulties, the university announced Monday. The gift from Walter and Marcia Kortschak to the new USC Kortschak Center for Learning and Creativity will help provide tutoring, counseling, technological assistance and treatment to students and will also help fund academic research in those areas. Marcia Kortschak is dyslexic, and their two children -- one a USC sophomore and another who will enroll at USC in the fall -- both have had some learning challenges, said Walter Kortschak, a Silicon Valley venture capitalist. Because his own family has experienced how much a tutor or mentor can help, Walter Kortschak said he hopes his donation will allow "all students to reach their highest academic and creative level." USC currently has excellent services in those areas, Kortschak said, but he wants to bring those up to "a world-class level." The Kortschaks' $10-million commitment is among the largest gifts to USC from non-alumni parents in the university's history and is the largest ever to the Division of Student Affairs, USC officials said. Polio attacked Len Estin when he was 13 years old, at summer camp in the Poconos. The teenager had thought his sudden fever and muscle cramps were no big deal, and was terrified to find himself locked in a glass isolation cell in a New York City hospital, with his parents peering at him from the outside. There was no polio vaccine back then. Estin's daughter, Alanna Levine (pictured), is now the mother of a 5-year-old and a 7-year-old, and she wants to make sure that their generation doesn't suffer from a resurgence of polio and other infectious diseases. Levine, a pediatrician who practices in Tappan, N.Y., is leading a new effort from the American Academy of Pediatrics to persuade parents that childhood vaccines are both safe and essential in protecting children from harm. She enlisted her dad to explain the realities of infectious disease to parents who have never seen a case of polio, measles, or mumps. "Our vaccination efforts have been so successful, these parents don't know what it looks like to have their children have these diseases," Levine says. "If we stop vaccinating, these diseases will return." Levine grew up hearing her dad's stories about polio. "A 32-year-old man was brought in about a half-hour after me, with the same diagnosis," Estin, 73, a retired businessman in Woodstock, N.Y., says now. "He was dead by morning. I later found out that they told my parents my chances of surviving were very, very small. That had an enormous effect on them." The teenager was quarantined in the polio ward for 21 days. "Many people died," he says. "Some, like me, recovered." He left the hospital with a limp and an almost useless left arm. The former football player found he couldn't run and couldn't jump. Physical therapy helped, though. "After two, three years I was pretty much recovered," Estin says. "I was one of the lucky ones." Parents ask Levine about the safety of vaccines almost every day, reflecting national surveys that show 54 percent of parents are concerned about vaccine safety, and 25 percent think that vaccines can cause autism. "There is a growing body of evidence that vaccines are safe," Levine says. "They do not cause autism, and they really are the best way to protect your child." I asked her about the fear that many parents have about vaccine safety, particularly since the Internet is rife with scary stories. Being concerned about your child is a good thing, she says, but in making medical decisions, " I urge them not to let the emotion factor in. You're talking about medicine, and medicine is a science, and you really need to look to the science to make those decisions." She makes a point of listening to parents' concerns, and taking them seriously. After that discussion, she says, most parents do decide to have their children vaccinated. Estin thinks back to his parents, and that day long ago when they were staring at him through the glass in the polio ward. If they were here today, he says, he would imagine they would express the importance of vaccines. Their granddaughter is saying it for them.